Homeostasis, the genesis of our research in smart materials, is the fundamental mechanism for organisms to maintain an equilibrium in physilogical variables that sustain lives. The research was initiated by understanding breathing behavior of organisms and further progressed into the artificial creations sprawned from such behavior across various fields. The question whether a smart material system can function as simply as organic activities leads us into the exploration of a series of materials that resembles such as breathing, among all others, intrigues us in the sentiment that its resulting mechanism of open/close behavior that enables air exchange and regulation in body temperature resembles that of ventilation to achieve comfort in an enclosed area. this then is oriented to the objective of water-driven breathin skin. Sodium polyacrylate, one of the superabsorbent polymers in the hydromorph family, is the major material for the skin system in the wake of the preliminary study for its high capacity of volume change when absorbing water up to 300 times of its volume in a short time span, and the effect of evaporative cooling as it prolongs the evaporation process. The study furthered into the tests of compositing and encapsulating with facilitating materials in understanding material behavior, which has concluded on the encapsulation of sodium polyacrylate with elastic fabrics, followed by a library of experiments in shapes, patterns and size in an attempt to optimize open/close mechanism to capacitate passive ventilation and cooling in hot and dry summer climates. The material system is operating on the basis cycle where sodium polyacrylate starts from dry state, swollen state by absorbing water, evaporation state that performs cooling and gradually moves towards dry state, repeating the cycle. To increase the responsiveness of the system, three different approaches of water supply for the cell were tested. among all, the water channeling is tested to be three times fast­er in swelling cells than soaking or spraying. therefore, channeling is the optimal means for water supply. 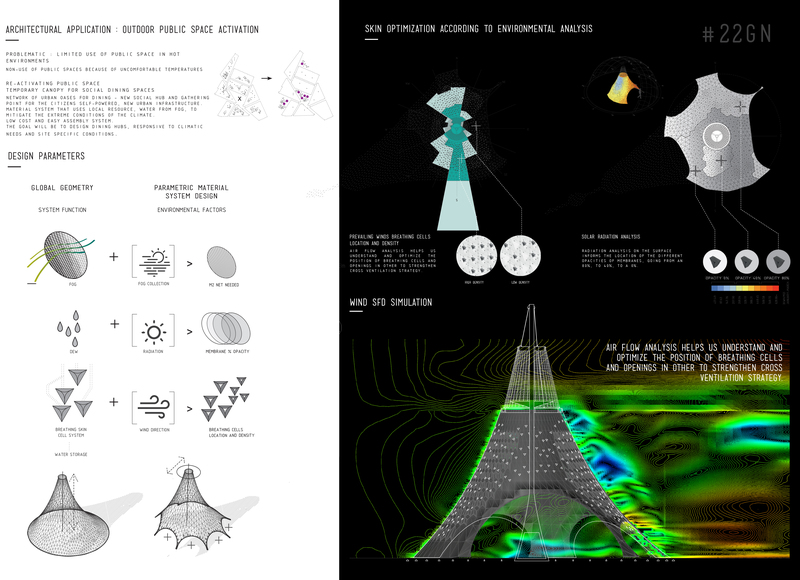 Taking into account the lack of water in targeted climates, the system design contemplated on the supply of water. fog/dew collection is adopted as an established local intelligence and is a natural cyclical system requiring no further consumption, and is 15 times more water-efficient than that of a misting system commonly used. 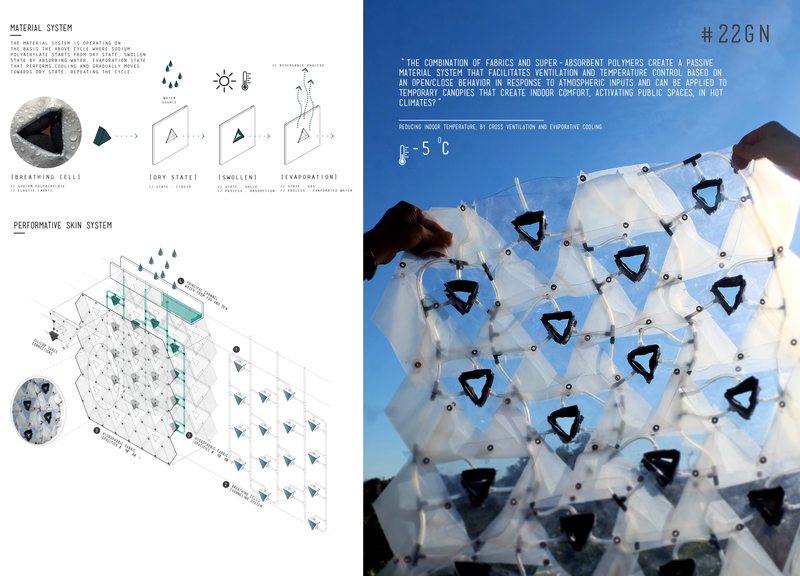 The performative prototype is fabricated with two hydrophobic membrane layers in diferent opacities regarding the solar radiation conditions of the site, holding the breathing cells connected to a 3d printed and tubing channeling system. the water is delivered by gravity from a principal channel. The cost of production of per m2 of the breathing skin system is around 9 eur, including the pvc membrane, sodium polyacrylate, elasic fabric and the complete channelling system. Water-driven breathing skin is developed to be a semi-passive material system for outdoor spaces in hot climates where public space is less welcomed due to the summer heat. with the material system, ventilation and evaporative cooling are made possible semi-passively in a tensile-structured form where the breathing skin is able to regulate the relation between our body and its surroundings and could take in multiple uses and forms. not only is it cost-effective in construction and maintenance, energy-efficient for areas in water shortage but also tensile and pliable for urban spaces.